There are five major areas of insulation to plan for: floor, walls, ceiling, doors, and windows. There are minimum insulation standards defined by your local building code with which you must comply. But spending a little more upfront to go beyond minimum standards could save enough on utility bills to compensate for the extra cost and then some. Spending a little time here will help you make the best choices. Interior wall insulation should be the last task done before hanging wallboard. 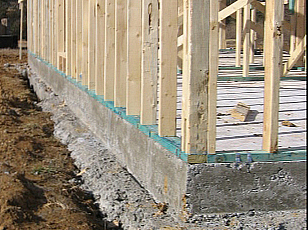 A concrete slab floor should be insulated on the side, above ground level. The framers will do this as they install sheathing to exterior walls. The sheathing extends below the framed wall and overlaps the concrete floor. You may also choose to insulate under the slab with rigid foam insulation on which concrete can be directly poured. Unventilated crawlspaces are becoming more common and if your plan calls for this and building code allows it, consider insulating the walls of the crawlspace instead of the floor. This can be done with rigid board, batts, foam, or combinations of the same.